[SatNews] This Company is bringing LCD technology into the world of TWTAs. 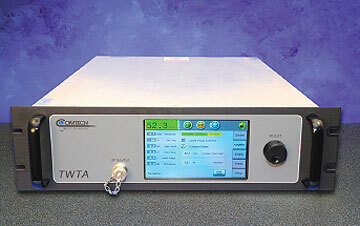 Comtech Xicom Technology, Inc. is introducing a new LCD (liquid crystal display) touch screen control interface for high-power traveling wave tube amplifiers (TWTAs). The new LCD touch screen provides an easy-to-use interface for monitoring and controlling SATCOM power amplifiers in an industry-standard 19-inch wide rack-mount configuration. The new touch screen front panel displays the HPA’s operational status including power output and temperature, graphical displays of parameter trend analysis, and event logs. Local and remote diagnostics can also be easily performed via an Ethernet interface. This new display eliminates the need for separate external controllers for common architectures because it can show and control waveguide switches and a combiner, providing both cost and space savings. Another valuable feature is that all operational data is saved within the amplifier’s non-volatile memory, providing a complete history of the HPA in the event that the unit needs service or repair.